You need to be a member of Tennessee to add comments! This is the last race of the year. You don't want to miss this. If never seen grudge racing, this is the time to see it. 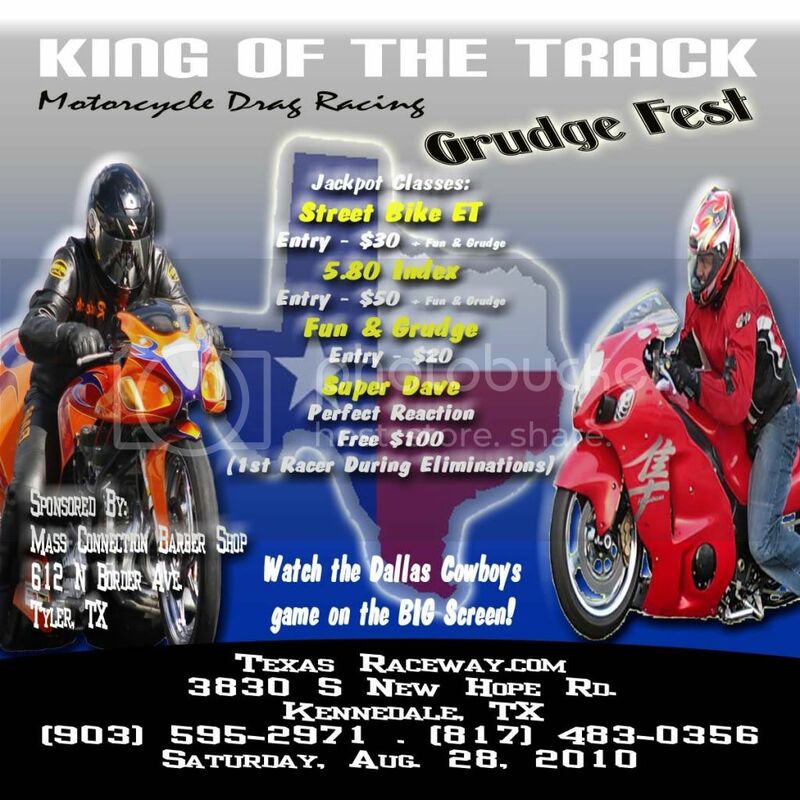 The King of Motorcycle Grudge Racing Keith "Shine" Dennis is coming to take over DFW. You seen him in all the drag racing and sportbike magazines. Also there's Street Bike ET, 5.80 index, Super Dave perfect reaction contest. The admission is $10 and $20 to fun & Grudge. Kids 10 and under is free. So bring the Family for some fun @ Texas Raceway. This race will go on @ night time so we can beat the heat. Go to www.texasraceway.com for track info. Please send out a PRAYER for SWEET BANDIT of the Memphis Chapter of the ZODIAC M/C, she has been in the hospital since Monday of this week. She is at 901-516-5549 if U care to call her! my wife Mishael passed her CAP-STONE yesterday an she gets to walk June 25th 2010 for her BA in Criminal Justice with high honors also.